Our weekend show pick feautres two up-and-coming Latin fusion bands profiled by Austin Vida in 2009: La Guerrilla and Este Vato. La Guerrilla gets down to South American and Caribbean sounds, while Este Vato blends some hip hop in their music. 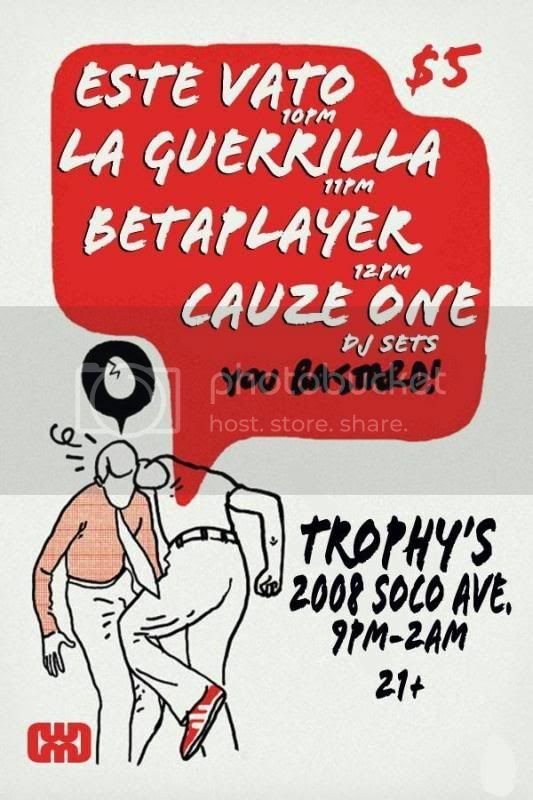 Headlining the show is Betaplayer, another great band from Austin that brings an intelligent hip-hop flavor. With a bill like this, there is zero reason for anyone not to be dancing. It also warms our heart that our weekend show pick is at Trophy’s, a South Congress venue that often gets left out of conversations about weekend shows. For those of you not familair with these artists, check out our Austin Vida videos of Este Vato and La Guerrilla. The Betaplayer video is courtesy of ‘NITES, the videoblog of Austin Vida’s managing editor Ajay Miranda.